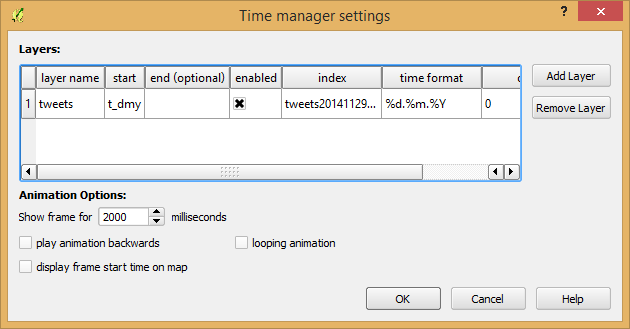 To add it to TimeManager as well, add it as a raster with the settings from the screenshot below. Start time and end time have the values 2005-08-29:03:10:00Z and 2005-08-30:03:10:00Z respectively, which is a period which overlaps with hurricane Katrina. Now, the WMS-T standard uses a handful of different time formats, and at this time, the plugin requires you to know this format and input the start and end values in this format. If there’s interest to sponsor this feature, in the future we may get the format directly from the web service description. The web service description is an XML document (see here for an example) which, among other information, contains a section that defines the format, default time and granularity of the time dimension. 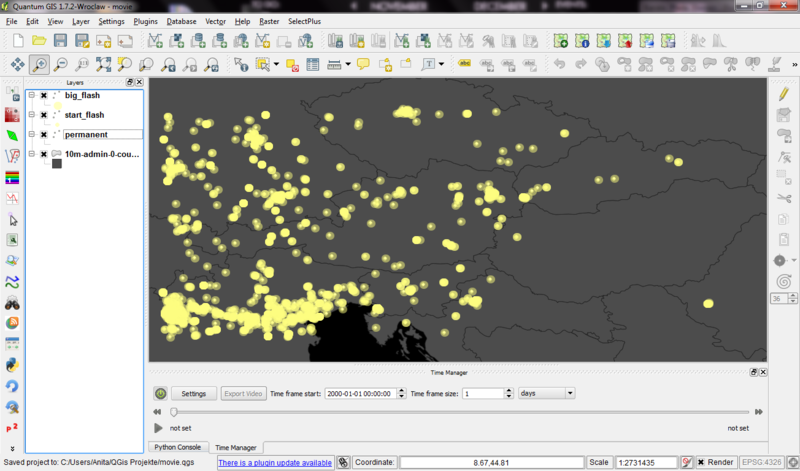 Do you like the QGIS heatmap functionality? Did you know that QGIS can also create animated heatmaps? The following video tutorial shows all necessary steps. 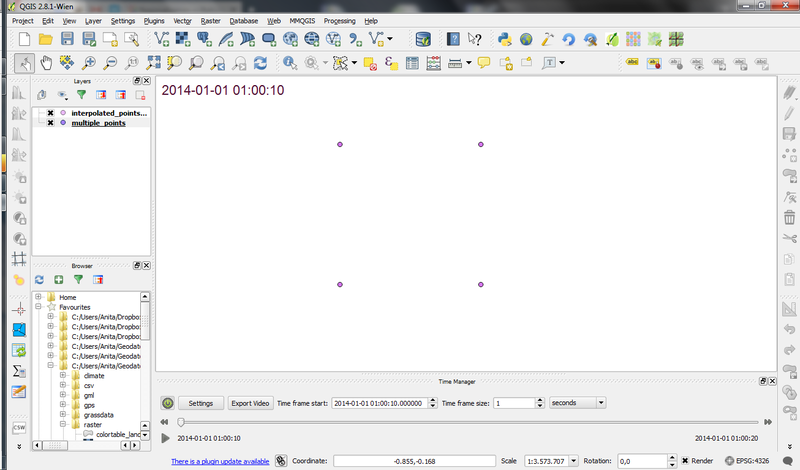 To reproduce it, you can get the sample data from my Time Manager workshop at #QGIS2015. Today was the final day of #QGIS2015 the first joint QGIS conference and developer meeting. I had the pleasure to meet Time Manager co-developer Karolina Alexiou aka carolinux in person and give a talk including a hands-on workshop on Time Manager together. 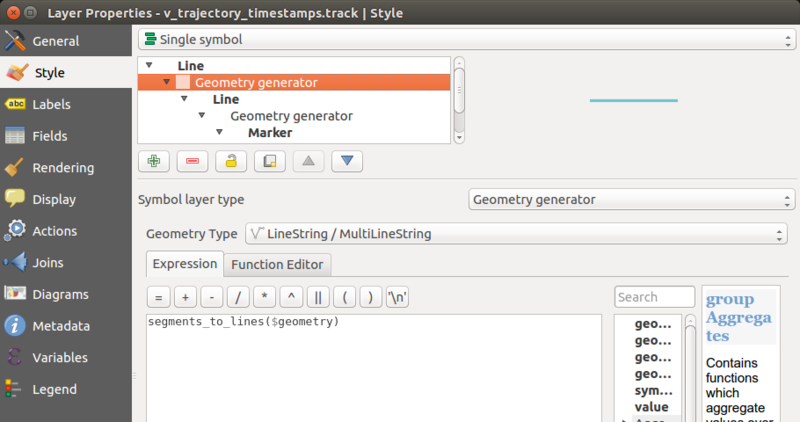 Time Manager makes it possible to explore spatio-temporal data by creating animations directly in QGIS. 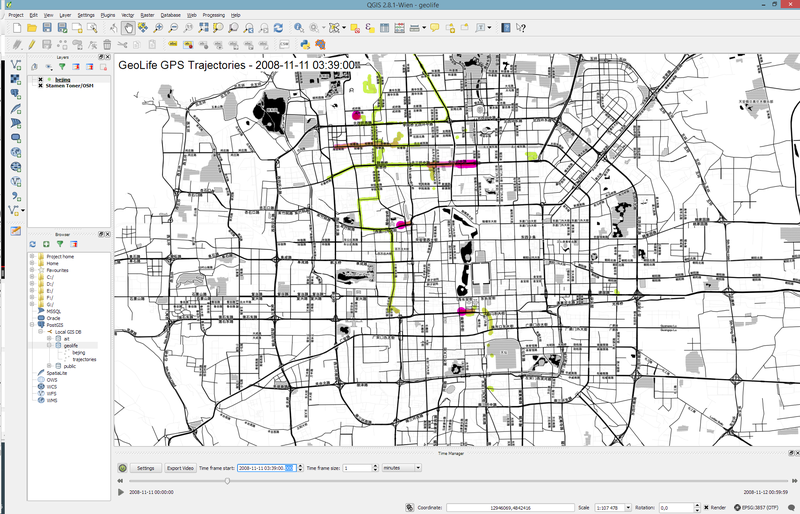 The talk presents QGIS visualization tools with a focus on efficient use of layer styling to both explore and present spatial data. 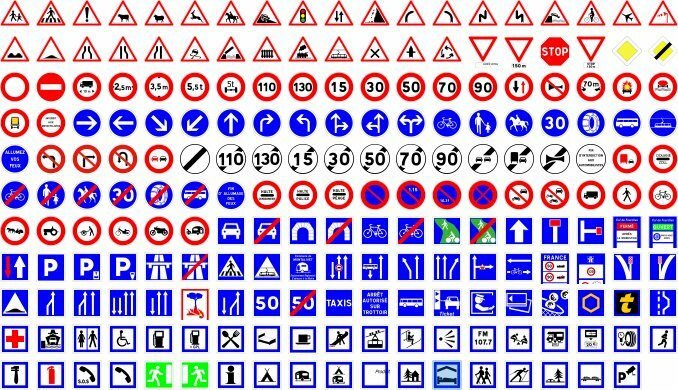 Examples include the recently added heatmap style as well as sophisticated rule-based and data-defined styles. The focus of this presentation is exploring and presenting spatio-temporal data using the Time Manager plugin. A special treat are time-dependent styles using expression-based styling which access the current Time Manager timestamp. 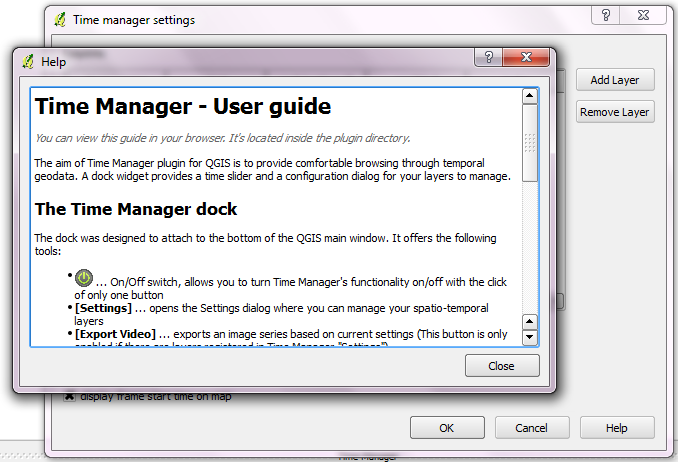 To download the example data and QGIS projects download Time_Manager_Examples.zip. The animation shows the current movement in pink which fades out and leaves behind green traces of the trajectories. Field 1: Latitude in decimal degrees. Field 2: Longitude in decimal degrees. Field 3: All set to 0 for this dataset. Field 4: Altitude in feet (-777 if not valid). Field 5: Date – number of days (with fractional part) that have passed since 12/30/1899. Field 6: Date as a string. Field 7: Time as a string. The idea behind this visualization is to show both the current movement as well as the history of the trajectories. This can be achieved with a fadeout effect which leaves behind traces of past movement while the most recent positions are highlighted to stand out. This effect can be created using a Single Symbol renderer with a marker symbol with two symbol layers: one layer serves as the highlights layer (pink) while the second layer represents the traces (green) which linger after the highlights disappear. 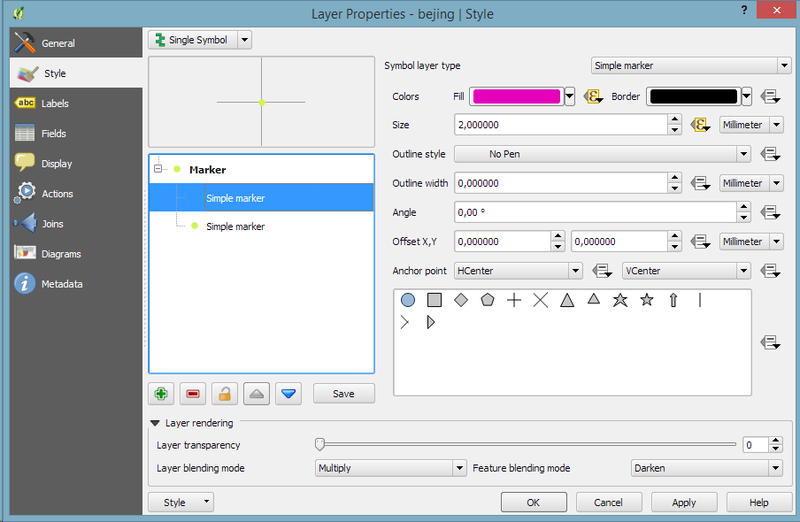 Feature blending is used to achieve the desired effect for overlapping markers. 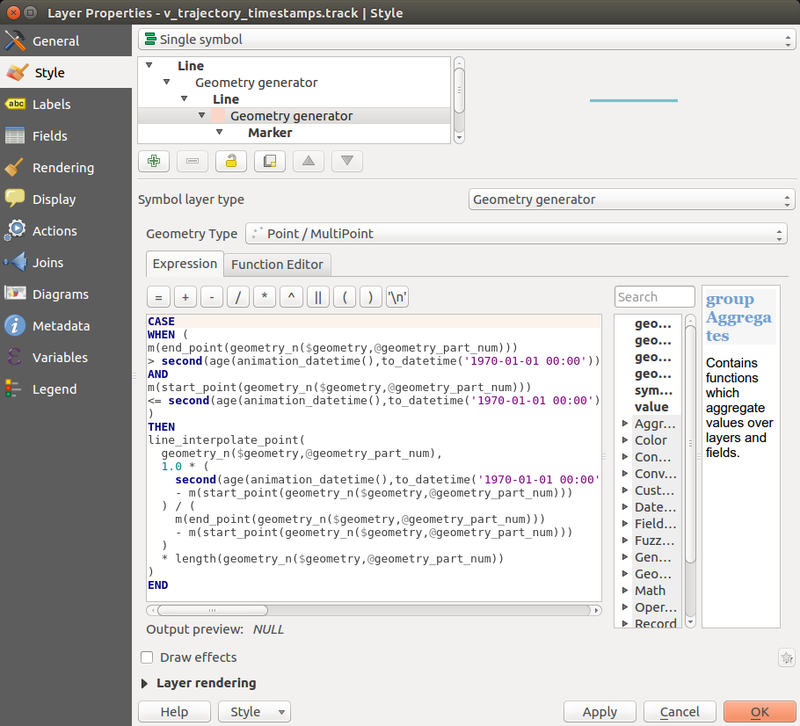 The highlights layer has two expression-based properties: color and size. The color fades to white and the point size shrinks as the point ages. 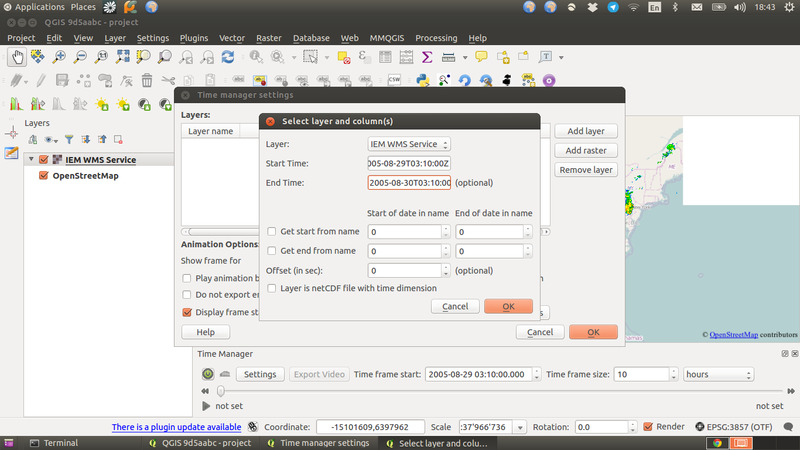 The age can be computed by comparing the point’s t_datetime timestamp to the Time Manager animation time $animation_datetime. I’m currently preparing this and a couple of other examples for my Time Manager workshop at the upcoming 1st QGIS conference in Nødebo. The workshop materials will be made available online afterwards. Yu Zheng, Lizhu Zhang, Xing Xie, Wei-Ying Ma. Mining interesting locations and travel sequences from GPS trajectories. In Proceedings of International conference on World Wild Web (WWW 2009), Madrid Spain. ACM Press: 791-800. Yu Zheng, Quannan Li, Yukun Chen, Xing Xie, Wei-Ying Ma. Understanding Mobility Based on GPS Data. In Proceedings of ACM conference on Ubiquitous Computing (UbiComp 2008), Seoul, Korea. ACM Press: 312-321. Yu Zheng, Xing Xie, Wei-Ying Ma, GeoLife: A Collaborative Social Networking Service among User, location and trajectory. Invited paper, in IEEE Data Engineering Bulletin. 33, 2, 2010, pp. 32-40. 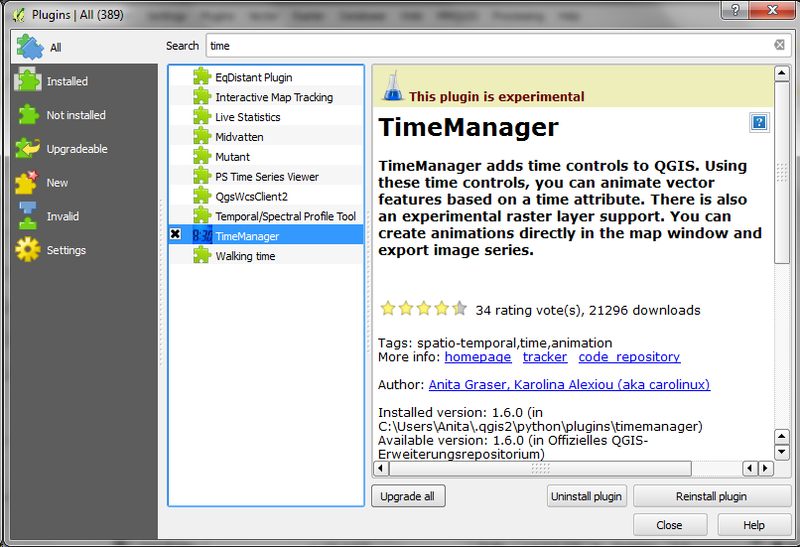 Over the last couple of weeks, Karolina has been very busy improving and expanding Time Manager. This post is to announce the 1.6 release of Time Manager which brings you many fixes and exciting new features. What’s this feature interpolation you’re talking about? Interpolation is really helpful if you have multiple observations of the same (moving) real-world object at different points in time and you want to visualize the movement between the observations. This can be used to visualize animal paths, vehicle tracks, or any other movement in space. 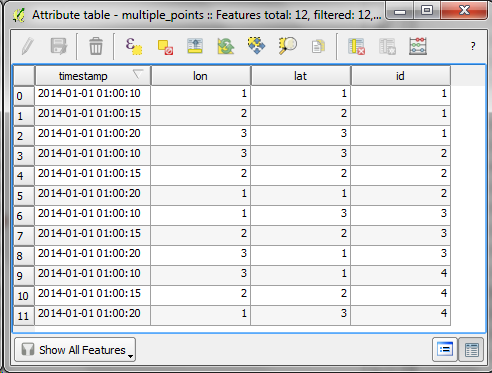 The following example shows a simple layer which contains 12 point features (3 for each id value). When you open the Time Manager 1.6 Settings | Add layer dialog, you will find a new option for interpolation settings. This first version supports linear interpolation of point features but more options might be added in the future. Note how the id attribute is specified to let Time Manager know which features belong to the same real-world object. 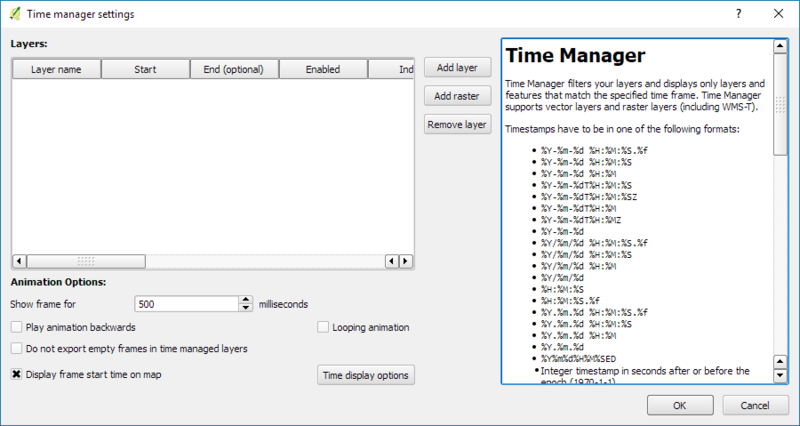 For the interpolation, Time Manager creates a new layer which contains the interpolated features. You can see this layer in the layer list. I’m really looking forward to seeing all the great animations this feature will enable. Thanks Karolina for making this possible! Today, I’ve released TimeManager 1.2 which adds support for additional time formats: DD.MM.YYYY, DD/MM/YYYY, and DD-MM-YYYY (thanks to a pull request by vmora) as well as French translation (thanks to bbouteilles). But there is more: the QGIS team has released a bugfix version 2.6.1 which you can already find in Ubuntu repos and the OSGeo4W installer. Go get it! And please support the bugfix release effort whenever you can. Point size shows storm class, labels read maximum speed in mph. If you are using Time Manager for your work, I’d love to hear about it. FOSSGIS2011 in Heidelberg was a great success for the QGIS project and for me personally. The audience was really impressed by Marco’s and Andreas’ presentation on QGIS Mapserver and GeoExt Web Client. My presentation on Time Manager for QGIS was followed by a series of interesting questions and comments concerning use cases in e.g. land use mapping. Requested features include support for raster layers and support for timestamps before year 19xx. I’ll be posting an English version of the Time Manager presentation including some additional comments here soon. Saving – Time Manager settings are now being saved to the project file. Image series export – animations can be exported as image series. Help files – The plugin now comes with a user guide / help file. Looping animations – When “looping” is enabled, the animation will start over from the beginning instead of stopping when it reaches the end. 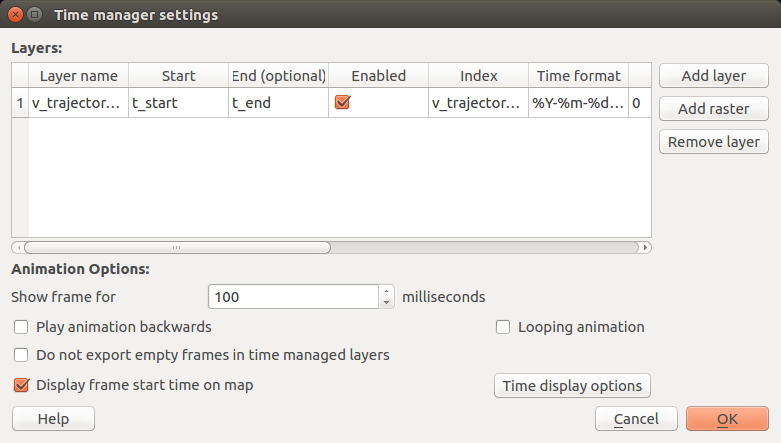 Time Manager is available through Geofrogger Repository. Give it a try!